The other day, a dear friend of mine and fellow blogger wrote a tongue in cheek piece about a failed -- but humorous -- shopping attempt at lululemon. You can read it here. As I read, I couldn't help but giggle to myself, because I could relate. I've felt like a fish out of water in a store that obviously wasn't intended for my wallet or my clothing size. I've also had one of those "OMG-I'm-Stuck-In-This-Spandex-Muffin-Top-Sucking-In-Swimsuit-And-I-Can't-Get-Out" moments while in a dressing room at Dillard's. 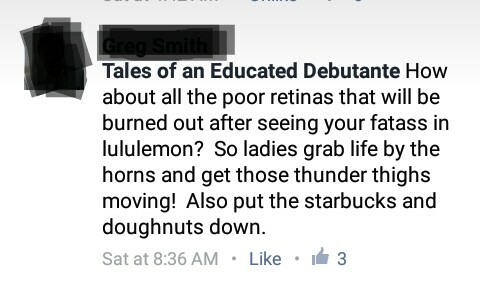 So when my friend wrote about her shopping experience at lululemon, I couldn't help but laugh a little. My laughing quickly turned to shock when I began reading the comment section. Seriously, why am I a glutton for punishment?! I couldn't believe the amount of backlash she received for writing about a personal shopping trip that didn't go as planned. More so, I was surprised by the amount of males who felt the need to leave body shaming comments on a blog that is mainly intended for moms. I once had a teacher who said, "if you throw a stick into a pack of fighting dogs, the one who barks the loudest is the one who got hit." Yep. I'm the barking dog. 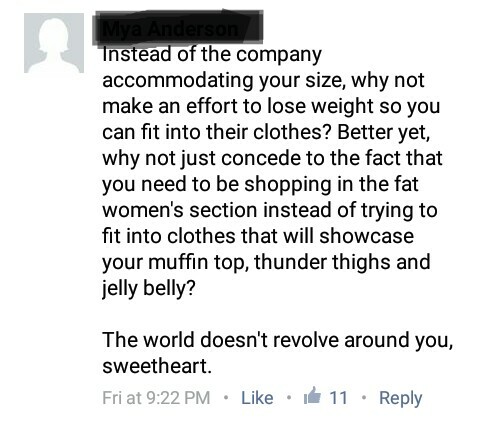 Those comments hit me right in my less-than-slim-gut. It's no lie that I've put on my fair share of post baby, post nursing, depression, ice cream obsession weight. I'm not proud of it, and I feel self conscious on a regular basis. I feel uncomfortable when I go shopping for clothes. I feel shame when I sit down to eat at a restaurant, because I worry that people are silently judging me -- for what I ordered, for eating all my food, for getting seconds. I feel embarrassed when I go for my run and cars pass me by. I am afraid they are laughing at how slow I am running, how short of breath I am, how out of shape I am. These are my issues and my insecurities, but they aren't mine alone and they aren't without cause. 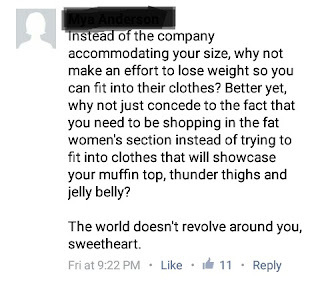 Just a glance through the comments of my friend's post proved that we have a long way to go when it comes to body acceptance -- accepting our own bodies and accepting the bodies of those around us. And while some of the commentors may argue that their harsh comments were tough love meant to motivate people like me to get into shape, I would have to disagree. Belittling remarks do not motivate and demeaning words do not inspire. 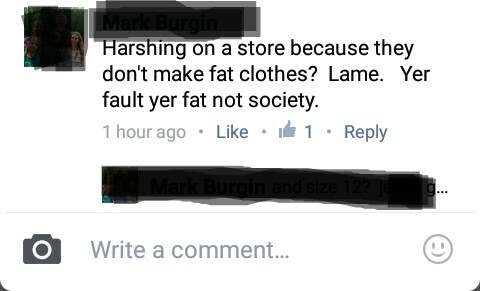 Shaming others over their weight has got to stop. Instead, let's accept that we have no control over other people's bodies -- what they weigh, how they look, what they wear, and let's focus on ourselves -- how we act, how we treat others, how we try to make the world a better place. Health and well-being are extremely important, but there is so much more to a person than what it is outwardly apparent. Maybe we should be less preoccupied with the amount of weight on other people and more concerned with the amount of goodness in our own souls.